High Quality Content by WIKIPEDIA articles! 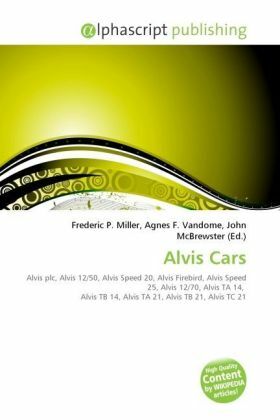 Alvis cars were produced by the manufacturer Alvis Car and Engineering Company Ltd of Coventry, United Kingdom from 1919 to 1967. The company also produced aero-engines and military vehicles, the latter continuing long after car production ceased. The original company, TG John and Co. Ltd., was founded in 1919. Its first products were stationary engines, carburettor bodies and motorscooters. The company's founder T.G. John was approached by Geoffrey de Freville with designs for a 4-cylinder engine with aluminium pistons and pressure lubrication, unusual for the period. Some have suggested that de Freville proposed the name Alvis as a compound of the words "aluminium" and "vis" (meaning "strength" in Latin) although de Freville himself vigorously denied this theory. Perhaps the name was derived from the Norse mythological weaponsmith, Alvíss, but the true origin is unknown. The first car model, the 10/30, using de Freville's design was an instant success and set the reputation for quality and performance for which the company became famous.